Beat Bop: Pop Star Clicker is a fun music-themed idle tapper game available on Google Play and the App store. The game follows your journey as an amateur cardboard guitarist and lets you evolve until you are a singing sensation. As you progress, earning idle income from merchandise and fan gifts, you will get an opportunity to build and improve your band, expand its presence outside your city and earn income. Beat Bop is in the list of clicker games that have an interesting story line and fun gameplay. Use both thumbs while tapping on the screen. This way you will fill up the music bar faster and also earn more coins. Once the bar is fully charged up, keep tapping with both thumbs. Two-finger taps + extra earnings from power-ups = score! While tapping, keep an eye the bottom of the screen, under the stage, for money bags and extra coins. Tap to collect them. You may choose not to tap as they will automatically be added to your total earnings after a few seconds. Money bags and extra coins will appear even if you stop tapping the screen. Sometimes, the game will throw a diamond or two and a gift from a fan. You can redeem fan gifts for diamonds. It costs only 3 diamonds, but lets you earn lots of coins in a very short period of time. All you have to do is tap and hold the screen. This will not only give a coin burst, but also keep the meter fully charged up earning extra coins (and imagine how much you will earn if you have a full band). Normally, you have tap and earn, but auto-tune lets you tap, press and forget. Just pressing the screen will generate coins. Auto-tune is available for a limited period of time. So grab it before it vanishes. Upgrading your music level in Beat Bop Pop Star Clicker not only grows your music career, but also lets you earn more per tap. 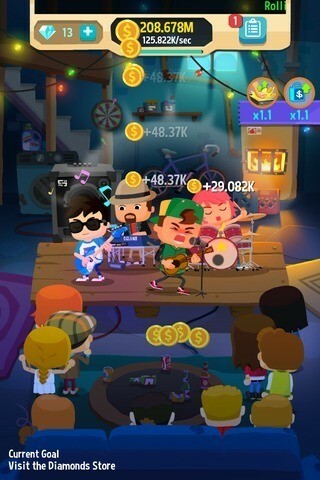 Your lead singer earns automatically via merchandise earnings, and your taps will get more coins from the contribution of fellow band members. The more music level-ups, the more items and new members you will add to your band. This will help you earn more coins, especially when the bar fills up. Make sure you keep tapping when the bar gets charged up to earn plenty of coins from your band members, musical items and the power-ups that get activated with the charge up. I do not prefer drawing tarot cards every now and then as most of the time I get a bad bonus that reduces my tap value for a few seconds or stops merchandise items from earning automatically for a minute or so. You can prevent such actions to be taken by watching a 30 second video, but many times such offers won’t be available. I recommend tapping on tarot cards on peak hours when there are more adverts (morning and evenings). If you get a good bonus after tapping a tarot card, you may watch a video to double the rewards. 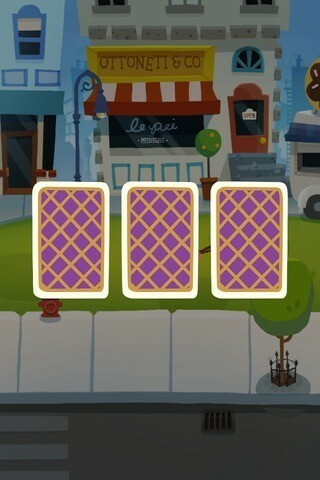 If you want a sure-shot reward, better choose “Manager Calls” instead of the tarot mini-game. You may have to watch a 30 second advert to receive the reward. Rewards are huge, such as 60x tap boost for 15 seconds, so don’t miss such opportunities. There’s no risk in trying out manager calls because all offers will be in favor of the pop star. You only have to watch a video to get the reward. Tap on the screen rapidly to fill the music bar. The music gauge is located at the top of the game screen. Once charged up, continue tapping to receive more coins and rewards. Keep the bar charged up (will turn blue in color) by tapping rapidly. Soon you will notice two power-ups appear when the bar is charged up. 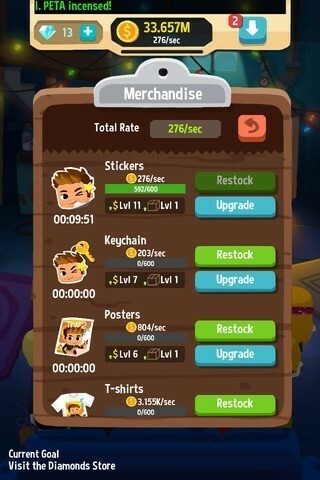 The first power-up increases your tap earnings by 1.1 times and the second power-up increases merchandise earnings by x1.1. So there is a huge advantage if you keep the meter filled up. Keep on tapping to make sure the music bar does not retract. If it goes back to zero, those two power-ups will disappear and you won’t earn bonus rewards and coins. Keeping the meter charged up and tapping rapidly also increases the chances of earning coin bags, fan gifts and maybe a gem or two. Restock merchandise from time to time to continue earning coins. Merchandise earns you coins by itself, but if it’s empty, it will stop earning for you. Make sure you have turned on notifications so that the game tells you to restock merchandise when it’s empty. Keep upgrading merchandise stock (requires diamonds) to increase max capacity. Career goals (objectives) can be seen at the bottom left corner of the screen. These are simple tasks that can be completed easily. You will be rewarded with bonus coins (a lot of coins) after completing these simple tasks. Tap on the checklist icon at the top-right corner of the screen and then tap on career goals to redeem rewards for your completed goals.